Maine Oxy was founded in 1929 in Auburn, Maine under the name Maine Gas Service providing sales and service to home propane customers. 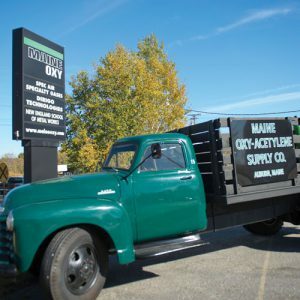 In 1935 Maine Oxy was incorporated as Maine Oxy-Acetylene Supply Company and began providing welding supplies and industrial gases for customers in Auburn and Lewiston, Maine and surrounding communities. From its modest beginnings, Maine Oxy has expanded to a company with multiple sales and manufacturing locations and currently operates 16 locations in Maine, Massachusetts, New Hampshire, Connecticut, and Vermont as well as three in Canada. Maine Oxy is a leading distributor of industrial, medical and specialty gases and a distributor of quality hardgoods including welding and cutting equipment, supplies and accessories. In 1993, Maine Oxy established the SpecAir Gases and Technologies division. 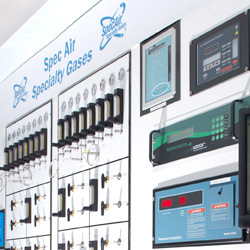 The SpecAir gas manufacturing laboratory, located in Auburn, Maine, is the largest independent specialty gas laboratory in New England and is also an ISO/IEC 17025:2005 accredited laboratory and production facility. SpecAir has also introduced the Enviro-Cyl line of environmentally friendly refillable products, leading the industry in replacing disposable calibration gas cylinders with refillables. Maine Oxy has a state-of-the-art acetylene production facility and has expanded our welder rental and services division, now renting MIG, TIG, Stick, plasma and portable gas and diesel welder generators. 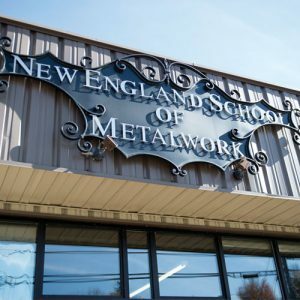 The New England School Of Metalwork is a local training institution. Which includes two core programs: Welding & Blacksmithing. They feature programs in all welding-related areas, including Welding Safety, MIG, TIG and Plasma. All courses emphasize welding safety and technique. The Blacksmithing and Ornamental Art Work programs are designed for all levels, from beginners through advanced. They also feature year round workshops. Throughout its history, the company has been dedicated to providing the most current technologies at competitive prices, while also engaging in a variety of initiatives to better the communities in which they operate. At Maine Oxy, customers are our reason for being. For more information, call 1-800-377-9433. Mission: Our commitment is to provide superior safety solutions, exceptional service, and quality products. In 2019, we’re celebrating 90 years. Learn more about our history and our future here!